Karuvepillai podi| Curry leaves Chutney powder is an awesome South Indian powder which is used as dip for Idli or dosa. Karuvepillai/ Curry leaves is a flavourful and also a healthy ingredient added in South Indian Cuisine. But we know most of use take the curry leaves out from curries and throw them out when we consume the food. Tamil Brahmin families normally are experts in this tasty podi which is made at home and is also tasty and has variety of uses. We can make Karuvepillai Kuzhambu, Karuvepillai sadam and also you could use this as a dip for Idli and Dosa. The curry leaves mixed with lentils and chillies gives a great taste . Also makes a instant mix powder for the rice, curry and also for idli dosas. People those who does not like curry leaves also fall in love with this healthy podi. 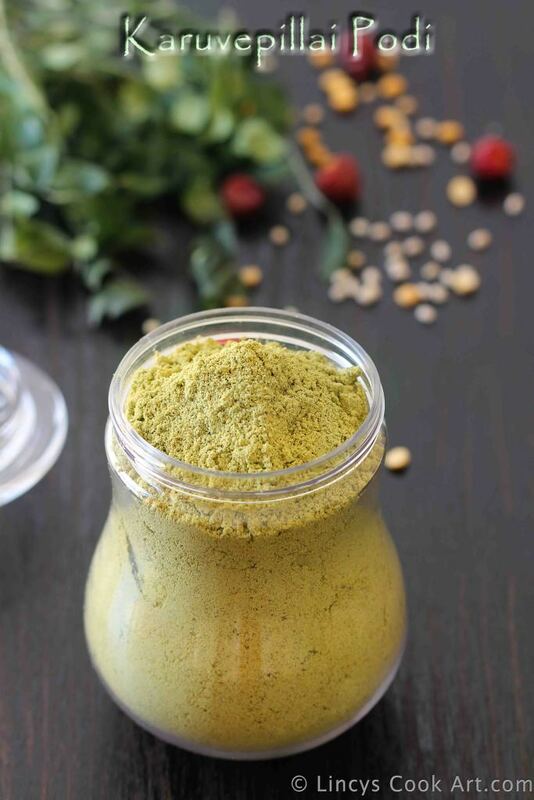 I am sure you are going to try this podi to make you family healthy and happy! Dry the curry leaves in shade for 2-3 days or you can dry roast them on medium flame in a pan till it reaches crispy and can crumble in your bare hands. If you are roasting, roast separately and allow to cool and add with other ingredients; powder it. Heat oil in and add the dried red chillies, pepper corns, jeera and tamarind. Roast till the dry chillies become crisp. Allow to cool them and add the curry leaves roasted/ dried with them. In a pan dry roast the channa dal, urad dhal separately till it starts to become golden. Transfer all the roasted items and some salt inside a blender jar and make them as a fine powder. I have powdered the dried red chilli lot with curry leaves first, in which the dried red chilli and the curry leaves are difficult to get powdered. Once they become powder add the channa dal and the urad dhal and powder well. Transfer the powder on a flat plate or paper and allow to cool. Transfer the podi on a air tight container. Refrigerate for longer storage that is more than a month. Take a tablespoon full of karuvepillai podi and make a depression at the centre and pour sesame oil on the depression and mix well and serve with Idlis. 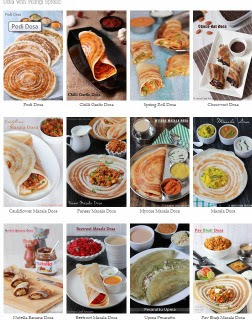 For Podi dosas, Once you spread the dosa batter on tawa sprinkle some oil and sprinkle some karuvepillai podi with hand (or) using pepper salt dispenser and cook the dosas till crisp.